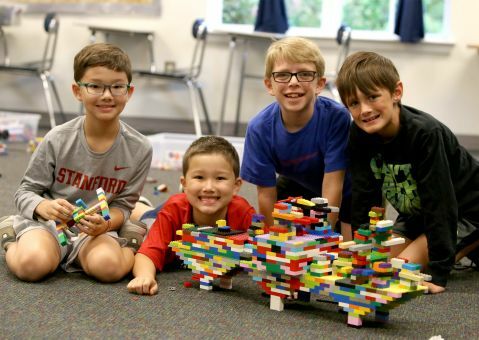 At Mount Paran Christian School, the development of faith and intellect continues to grow through the summer months with a variety of summer programs. Academic enrichment, athletic training, arts explorations, and faith development are all part of the fun half and full-day camp offerings at MPCS. Parents can customize their lower school child’s day to include camp experiences from 7:30 a.m. until 6:00 p.m. Early Care: 7:30 a.m. to 9:00 a.m. Registration required. No fee. Session One Camps: 9:00 a.m. to 12:00 p.m. Registration required. Fees noted. Camp Eagle: 12:00 p.m. to 4:00 p.m. Registration required. Fees noted. Select either a Session Two Camp or Camp Eagle for your child. Includes a supervised lunch. Bring lunch from home. Campers are asked to bring a morning and afternoon snack, and a water bottle. Session Two Camps: 1:00 p.m. to 4:00 p.m. Registration required. Fees noted. Late Care: 4:00 p.m. to 6:00 p.m. Registration required. $50 per week. *Students attending both Session One and Session Two Camps will have a supervised lunch time from 12:00 p.m. to 1:00 p.m. at no charge. Lunches must be brought from home each day. All students Kindergarten - 12th must fill out a medical form if they are attending a camp. Only one form per student is necessary for the whole summer. Students currently enrolled at MPCS do not need to fill out this form. Calling all creative minds! In the Construction Zone, we will construct, create, analyze, and evaluate buildings, cars, trains, bridges anything that can be constructed! Using a variety of building materials such as Legos, wood, clay, and tools, we will explore the possibilities that exist when we use our imaginations! Preschool children ages 3-4 who are NOT currently enrolled at MPCS will be required to submit an additional form to finalize camp registration. This step ensures proper protocol and safety for all young children participating in activities on our campus. The additional form will only need to be filled out once for all summer programs. Girls come dressed every day as your favorite princess as we have fairytale​ fun! We will celebrate many of our favorite princesses as we have a frozen day, an under the sea day, a tea party day, and other princess fun! Preschool Camp Eagle is from 12:00-4:30pm Monday through Friday. Your camper will need to bring their lunch and an afternoon snack each day. We will have rest time, outdoor play, centers, and other fun activities. Need to drop your camper off early? Early Care is designed for those working parents to drop off as early as 7:30a.m. This is our fifth year of Fishing Camp! During our camp, you will learn how to fish for Blue Gill, Sun Fish, Bass, and the occasional turtle. You will be taught to use an open face, closed face and be introduced to fly fishing. We will also learn how to survival fish and learn how to find bait in addition to learning about Outdoor survival, snake identification (not live snakes), explore the lake on kayaks and learn how to drive a trolling motor. This will be a fun and safe camp. Safety is a top priority. During the lake portion,​ each student will wear a life jacket and have an instructor with him/her. Participants in the All-Skills Softball Camp will learn the fundamentals of the game which will immediately improve their game as a player. Campers will be placed in groups according to age. We will focus on throwing, infield and outfield fundamentals, base running, hitting and bunting. The Mount Paran Coaching Staff will instruct offensive and defensive skills. Offense will focus on proper technique and mechanics. Defense will focus on fundamentals and position play. Base running will also be included. What is more fun than only building robots? Sumo battles with robots! Campers will learn how to build competitive robots for scenarios including sumo battles while learning more about the engineering design process and robotics. Program will be led by Tina and Steven Baker. In this camp, girls will be taught sideline cheerleading skills as well as introduce stunting skills. The state champion varsity cheer squad will work with girls in small groups to teach technique, motions, cheers, chants, dances, and fundamentals of cheerleading. We have an excellent cheer program at MPCS beginning in 6th grade and we encourage all girls interested in cheering to come join us for this fun filled camp! Camp Eagle is from 12:00 p.m. - 4:00 p.m. Monday through Friday. Your camper will need to bring their lunch and an afternoon snack each day. We will have outdoor time, STEAM, sports, arts and crafts, and academic activities. Does your camper need to stay after Camp Eagle? You can register for late from 4:00-6:00, Monday- Friday. Campers will be involved in constructive activities during this time. Calling all young artists! In Art Camp, we will create art projects using a variety of mediums. Come ready to learn and explore different ways to create Art! Come join us for Adventure Camp! It will be a week full of nature walks, campfire stories, a campout​, some fishing in our makeshift pond, and many other things that will help us celebrate all the beauty and fun God created for us in the great outdoors. We’ll have plenty of camping snacks and crafts as well like s’mores and trail mix and frames filled with pictures of all our fun! Grade Level: 3 - 5 yrs. These charming camps, which include a different tale each day, are a delight for ballerinas & princess lovers! Professional ballet instructors will teach our curriculum using full French terminology and formal technique in a fun and nurturing environment. Daily themed crafts like Sofia’s magical wand and games like Merida's Highlands hop! We have five perfect themes to choose from. Campers will need to pack a snack (non-sticky and nut free), bag lunch and bring a water bottle for morning camps. Journey through America's musical periods and styles as we sing, dance, play instruments and perform! Music campers will learn about Jazz, Musical Theater, Marching Bands, Folk music, Patriotic songs, The Blues, and Rock and Roll! We will play a variety of instruments and have fun learning old and new songs to sing and perform! This camp is an opportunity for young players to gain an edge by learning the skills and techniques that will be used in both middle and high school programs in the coming years. Players will be divided into appropriate teams and age groups. Drills and techniques will be coached by varsity players and staff. Each day a new sport will be introduced, taught, and played, and each day will end with a fun, crazy sports game! Sports that will be taught include basketball, baseball, tennis, kickball, and a number of backyard games. If you love playing a variety of sports and having fun this is the camp for you. Sports Extravaganza Camp will be led by Matt Manry. What is more fun than only building robots? Sumo battles with robots! Campers will learn how to build competitive robots at an advanced level for scenarios including sumo battles while diving deep into the engineering design process, robotics, and programming. Program will be led by Tina and Steven Baker. Come join us for a fun week of celebrating America!! 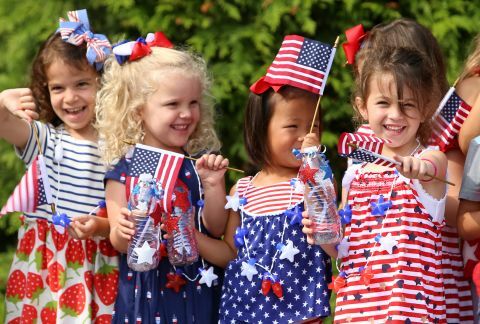 Everything we do will have a red, white, and blue theme...crafts, games, baking, to name a few things.. and even a parade!! If you want to learn about America and have a grand time while doing so, then this camp is for you! Summer is HOT, but Splash Camp will keep you cool! Throw on your swimsuit​ and come play water games with us this summer. Well, read a water-themed Bible story each day; then run outside for fun in kiddie pools, sprinklers, and more. Don't forget your sunscreen! Grade Level: 4 - 6 yrs. Fancy Nancy is sure to be a hit this summer! Budding dancers will delight in a full week of fun with this popular and marvelous character. Fancy Nancy storydances are sure to please your dancer, along with fun pampering in the Beauty Boutique, themed crafts from daily stories, and snack time with friends at our Majestic Tea Table. Friday’s show will dazzle family and friends! Daily performances will include Fancy Nancy, Ooh La La Its Beauty Day!, The Show Must Go On, and Explorer Extraordinaire . Campers will need to pack a snack, bag lunch and water bottle. This co-ed camp will focus on athletic and skill development, and offensive and defensive concepts, and will help increase the knowledge and enjoyment of the game of basketball. Players will be coached by the Varsity Boys and Girls' Coaches, as well as current varsity players. Players will be broken down by ability and/or grade level to maximize instruction. In Escape to the Mountains,​ students will experience a camp like feeling while they roast marshmallows, kayak around our beautiful lake, fish, play fun games and do a daily craft. Students who are in rising second grade or younger will be accompanied while they are kayaking! Don't miss out on this fun camp-like experience! Mount Paran soccer camp focuses on the individual technique of the players and it is designed to create a positive God driven learning environment in which each player can develop their self-confidence and stay motivated to reach their peak playing ability. Mount Paran’s experienced coaches will provide personal instruction in every phase of soccer, with special emphasis placed on proper passing, trapping, shooting, ball handling and defensive techniques. Learning is achieved through small sided games and we strive to not only teach the game but to develop a passion for the game of soccer. The camp curriculum will challenge the campers, but they will have fun while playing in a competitive environment. Gabby Dyer is head girls soccer coach for MPCS. A former Division I soccer player, Gabby has 12 years of elite level playing experience under her belt. In addition, Gabby serves as a strength and conditioning coach at MPCS and has collegiate coaching experience in this expertise as well. Peter Baubles is the head boy’s soccer coach for MPCS. He was the former coach at Macon East Academy, in Montgomery, AL, where he started the boys and girls soccer program. At Macon East he led the boys and girls to three final four appearances each and two state runner-up appearances for the boys and one state runner-up appearance for the girls. In addition to coaching, Peter also teaches freshman history at MPCS. Adam Muncy is the assistant varsity boys’ soccer coach and the goalkeeping coach for both varsity boys and girls. He also coaches after school sports performance programs for middle and high school boys. He attended high school in Virginia where he was awarded AA Region 3 player of the year, Blue Ridge District Player of the Year, and First Team All-State as a goalkeeper. He went on to play D1 soccer at Radford University. Soccer has been a huge part of his life since he was little, and he loves teaching others about his passion and watching them grow in confidence and skill. Adam will be focusing on the essential building blocks of goalkeeping which includes correct form, correct fundamentals that can be overlooked, and also teaching keepers how to read plays from the back so they can be that crucial leader for their team. Goalkeepers will learn through specific drills, repetition, and small 1v1 games. In Escape to the Mountains, students will experience a camp like feeling while they roast marshmallows, kayak around our beautiful lake, fish, play fun games and do a daily craft. 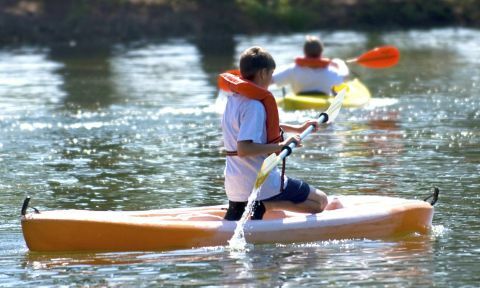 Students who are in rising second grade or younger will be accompanied while they are kayaking! Don't​ miss out on this fun camp-like experience! Save the world with LEGO® Super Heroes! Build the hideouts and vehicles of your favorite caped crusaders and learn what makes them not only Super Heroes but Super Hero Engineers! An experienced Play-Well instructor guides young heroes as they design, build, and save a city where ingenuity and imagination can solve any conflict. LEGO® Super Heroes need your help to defeat the destructive forces of evil arch-villains as they threaten LEGOpolis! Explore the tools and techniques of your favorite caped crusaders and learn what makes them not only Super Heroes but super engineers. An engineering curriculum designed by Play-Well challenges heroes to design, build, and save a city where ingenuity and imagination can solve any conflict. Students will learn about the sport of soccer: skills, techniques, tactics, and goalkeeping will be taught. Players will be grouped according to their age, skill level and experience and they will have the opportunity to scrimmage every day. If you are new to the sport, come on out and develop your skills and knowledge of the game. This is a camp designed to instill the "love of the game" in boys and girls. This program is for new players, as well as, players that have played soccer. Coaches focus on building fundamental skills, helping players increase their skills, through a series of quickly paced challenges and games. Grade Level: 6 - 11 yrs. OUAB invites boys and girls to enjoy all of the fun of the New York stage with these one-week camps. Dancing, singing, and acting are what it takes to become a Broadway bound performer! Musical Theater Campers participate in jazz technique as well as acting and vocal games daily. Performers will learn two show songs from the musical they are working on throughout the week. They will also get a sneak peak of the backstage magic with prop design and stage make-up. Friday’s show will delight guests and we bet you’ll call for an ENCORE. Certain week’s camp offerings include an art component that will allow your camper the opportunity to create beautiful paintings and other mediums. Campers will need to pack a snack, bag lunch for morning or all day camps. Cooking Camp will be a hands-on, food-filled week where your little chef will use recipes to measure, mix, and cook kid-friendly foods! We will make a different recipe each day, which your child will bring home to enjoy. We are looking forward to this culinary adventure! See you there! Come and join us for a fun week of experiencing music through singing and dancing with scarves, ribbons, and beanbags. The children will also be learning how to play a variety of musical instruments each day. This co-ed camp is geared towards introducing, establishing, and reinforcing foundational basketball skills to children grades K-5th. Participants will learn the importance of basketball safety while focusing on key areas such as ball handling, shooting, defense, and plyometrics. The Advanced Fishing Camp is for 3rd-8th grade anglers who want to learn more about how to catch game fish. The students are taught by several of our high school fishing team members and are instructed on tournament fishing along with how to work artificial bait. Students will learn about all of the different aspects of tennis: serving, volleying, forehands, backhands, and overheads. The camp will be set up in an academy style where kids will be grouped according to their skill levels. Whether you are just beginning or are an advanced player you are sure to learn something new at our tennis camp! Players will be taught by varsity tennis coaches Jason Beard. Summer is HOT, but Splash Camp will keep you cool! Throw on your swim suit and come play water games with us this summer. Well read a water-themed Bible story each day then run outside for more fun in kiddie pools, sprinklers, and more. Don't​ forget your sunscreen! Does your little one love to draw or create? Are they the next Picasso or Michelangelo? Then an Arts and Crafts camp is for you! Campers will learn to see the world through the lens of an artist. We will be drawing, painting, using water color, and making sun catchers, just to name a few things. Crafts will be geared for both girls and boys. So, let’s explore your inner creativity together that will reveal your unique gifts. Dive into adventures Under the Sea with us this summer with some of our favorite stories and songs. Little entertainers make their performing debut while learning fun songs and 'pretending'. With a focus on the art of acting and singing, campers will spend time working on simple acting/vocal concepts such as movement, voice, and stage presence. All Show Offs welcome! Performers will get an opportunity to showcase their talents with a Friday performance. Campers will need to pack a snack, bag lunch and water bottle for certain weeks. Braves Baseball Camps provides unrivaled access to your favorite team. Join us at Mount Paran Christian School during the week of July 15th for four (4) days of Braves Baseball instruction decked out in a full Braves uniform! During our fifth day of camp we will take a VIP tour of SunTrust Park which includes a meet & greet with a current or alumni Braves player. Use the code MPCS19 to save $45 off tuition! If you enjoy Makerspace time during the school year in the Myrick Media Center, you will LOVE Makerspace Camp!! It will be filled with a variety of fun activities such as Legos, Duplos, Osmo, Rainbow Loom, Magnetic Tiles, Keva Blocks, critical thinking games, and art/craft projects. Centers will be set up and students will be able to choose which activities that they would like to participate in. Rising 3rd-5th Graders. This camp will provide students the opportunity to bake yummy treats in a fun filled environment. We will create a new treat each day which will include picking out the ingredients, measuring, and cooking our treats. We will have a lot of fun in this class making messes and creating treats to enjoy with our friends. We hope to see you at Baking Palooza! This camp will allow your little ones to imagine and create their very own race car or robot. We will introduce the engineering design process to the campers and then utilize the steps: Ask, Explore, Model, Evaluate, Explain. Through this process we will begin developing a growth mindset and a “can do” attitude when approaching difficult tasks. Students will utilize a variety of materials so be ready to get messy! If you enjoy Makerspace time during the school year in the Myrick Media Center, you will LOVE Makerspace Camp!! It will be filled with a variety of fun activities such as Q-BA-Maze Marble Run, Perler Beads, Osmo, Legos, Rainbow Loom, Magnetic Tiles, Keva Blocks, critical thinking games, and at/craft projects. Centers will be set up and students will be able to choose which activities that they would like to participate in. Grade Level: 6 - 9 yrs. Daily classes in dance are just the beginning of fun! Dancers will delight in a full week of fun with new and popular characters just added to our story repertoire-including new doll of the year Luciana, who wants to be an Astronaut. Each week will include two-three of our favorite stories. Activities will vary from Exploring with Lea, painting with Saige, science with Luciana, Ballet with Isabelle, Tap Dance with Molly, or Learning the Stars and Stripes with Julie! Includes daily ballet, tap, or jazz classes, fun pampering in the Boutique, doll-themed crafts from daily stories, and snack time with friends. Friday’s show of American Girl-inspired period dances will dazzle family and friends! Certain week’s camp offerings include an expanded art component that will allow your camper the opportunity to create beautiful paintings and other mediums. This redesigned volleyball camp is open to beginners and experienced young players. We will split into groups based on experience and skill. The beginner court(s) will focus on learning basic skills and developing a love for the game of volleyball. The experienced court(s) will focus on skill development using Gold Medal Squared techniques and philosophies, and players will compete in drills and games. Camp will be led by the 2018 State Champion MPC coaching staff and varsity players. Who’s ready to come back to school? Not me, “you said!” Well, how about you come back ahead of the game. This camp will provide a refresher in math, reading, and writing. Campers will stimulate and enhance fundamental skills that was covered in the 2018 – 2019 school year. We will focus on reading, math facts, and writing through storytelling, games, songs, and other fun activities. So, if you want to get a head-start on your academics with your peers and have fun, this camp is for you! Are you ready to come back to school? Not me, “you said!” Well, how about getting ahead of the game. This camp will provide a refresher in math, reading, writing, and assistance with summer reading requirements. Campers will stimulate and enhance fundamental skills that was covered in the 2018 – 2019 school year. Students will participate in math games, brain teasers, problem solving, storytelling to enhance reading and written language, and other fun activities. So, if you want to get a head-start on your academics with your peers and have fun, this camp is for you! This volleyball camp is designed to help players with experience further develop their skills and competitive play through the methodologies of Gold Medal Squared. Rising 7th and 8th grade girls are encouraged to attend, but we will cap the middle school court at 16 girls so that all girls receive individual training, so sign up early to reserve a spot! Once players have been registered and have paid through the MPC summer camps site, they must also be registered through GMS at www.goldmedalsquared.com to pick a t-shirt size and complete the waiver. Players' spots are NOT reserved until they are registered in both places, and girls cannot participate without registering in both places. This volleyball camp is designed to help players with experience further develop their skills and competitive play through the methodologies of Gold Medal Squared. It is only open to the members of the JV and Varsity teams as the camp serves as our preseason opportunity to train at a high level before beginning the 2019 seasons. Trained Gold Medal Squared coaches will lead each court. Please remember to register at www.goldmedalsquared.com to pick a t-shirt size and complete the waiver. Girls cannot participate without registering in both places. Early Care for preschool is included and no registration is required. Are camps open to students who don't currently attend MPCS? Yes! All camps are open to non-MPCS students. Preschool children ages three through four who are NOT currently enrolled at MPCS will be required to submit an additional form to finalize camp registration. This step ensures proper protocol and safety for all young children participating in activities on our campus. The additional form will only need to be filled out once for all summer programs. Simply follow the above link to the Summer Programs listings. Create an account, select a camp, register, and pay using the secure online credit card payment system. Is there an alternative to registering online? All registrations and payments are handled online. If you are unable to register or pay online, please contact the Summer Programs director. Upon successfully registering, you will receive an email confirmation. You will also receive a reminder email with details about your camp(s) several days before the start date of camp. Is this a licensed program? The MPCS campus in its entirety is not required to be licensed by the Georgia Department of Early Care and Learning (Georgia DECAL). However, MPCS is supported by the much higher standards of the dual AdvancEd/SAIS accreditation. MPCS reserves the right to cancel any summer camp in case of unforeseen circumstances. Full payment for the camp will be credited back to the card on file. In the case that a student withdraws more than two weeks prior to the camp start date, a refund will be made, minus a $20 non-refundable processing fee. In the case that a student withdraws fewer than two weeks before the start date of the camp, no refund will be made.